The last time I did linoleum cut printing, I was in high school. Recently I purchased some rubber stamp making supplies (rubber blocks, cutters and a variety of blades, ink pads in assorted colors) to satisfy an urge to do more hand work. Most of my art is created with the use of an electronic pen and pad and a computer monitor, and although it’s still hand drawing and I do love that medium, I’ve had an itch for something more tactile. Plus, I just love the look of wood cut and linocut printing and of rubber cut stamp prints. One of the things I find really attractive about these mediums is their graphic quality. As an aside, this past summer while visiting Mendocino, CA, I stumbled upon the woodcut print works of a local artist named Emmy Lou Packard (1914–1998). She’s well-known in that area, but I had never been introduced to her works before and I found them absolutely beautiful. Here you can see images of her work. 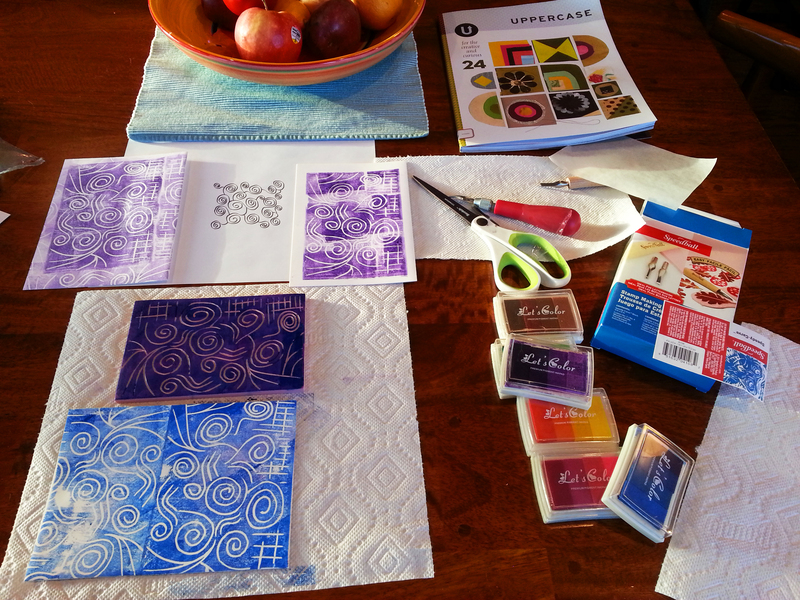 To get started with rubber stamp making, I’ve been using the entire 4″ x 6″ block of rubber and taking my designs all the way to edge, rather than cutting a specific shape and embellishing it. I’m planning to do that, too, but for now it’s all about practicing the process. I find the carving part very relaxing – even meditative. It will probably become more so once I find my groove. I love when an urge to do something new takes hold. I love that sense of fresh energy it stirs up. To keep learning is to keep expanding, evolving and moving forward.